Seeds often globose or ± so, exotesta fleshy, endotesta crustaceous; albumen fleshy; cotyledons broad, flat. Dioecious or rarely monoecious trees or shrubs, usually with a simple indumentum. Leaves alternate, petiolate, stipulate, simple or lobed, entire or toothed, peltate or not, palminerved and/or penninerved, gland-dotted on lower surface. Inflorescences axillary or subterminal, racemose or paniculate, shortly pedunculate; bracts entire or lobed, glandular or not; male bracts many-flowered, female bracts usually 1-flowered; flowers shortly pedicellate or subsessile. 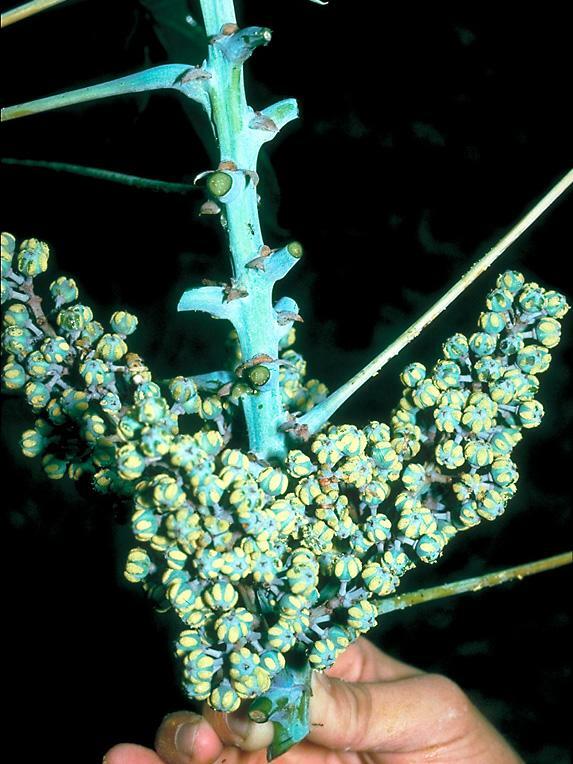 Male flowers: calyx closed in bud, globose or clavate, later valvately 2–4-partite; petals and disk absent; stamens 2–5 or 10–20, filaments short, free or ± connate at the base, anthers small, terminal, apicifixed, (2)3–4-celled, (2)3–4-valved, transversely or cruciately dehiscent; pistillode absent. 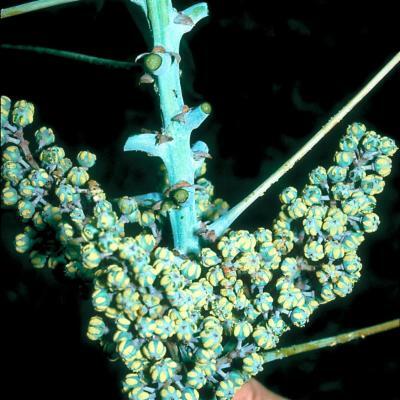 Female flowers: calyx truncate or shallowly toothed, later becoming broadly cupular and splitting; petals and disk absent; ovary 1–3-celled, with 1 ovule per cell; styles 1–3, often rather stout, entire, free or connate at the base. Fruits not lobed, or less often 2–3-lobed, dehiscing into bivalved cocci or subindehiscent, smooth or verrucose, usually glandular. Seeds ± globose; exotesta fleshy; endotesta crustaceous; albumen fleshy; cotyledons broad, flat. Macaranga advena Pax & K.Hoffm. Macaranga alchorneoides Pax & Lingelsh. Macaranga angustifolia K.Schum. & Lauterb. Macaranga astrolabica Pax & K.Hoffm. 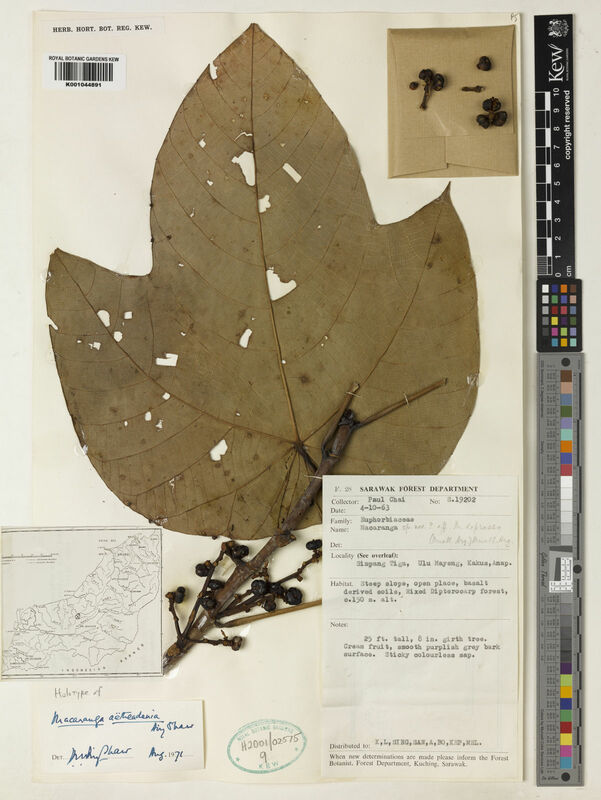 Macaranga balabacensis Pax & K.Hoffm. Macaranga brachythyrsa Pax & K.Hoffm. Macaranga brunneofloccosa Pax & K.Hoffm. Macaranga bullata Pax & K.Hoffm. Macaranga caudata Pax & K.Hoffm. 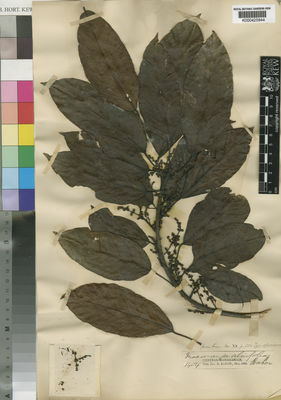 Macaranga chrysotricha K.Schum. & Lauterb. Macaranga cissifolia (Zoll. & Rchb.f.) Müll.Arg. Macaranga costulata Pax & K.Hoffm. Macaranga crassistipulosa Pax & K.Hoffm. Macaranga cuneifolia (Rchb.f. & Zoll.) Müll.Arg. Macaranga cuspidata Boivin ex Baill. Macaranga ebolowana Pax & K.Hoffm. Macaranga eloba Pax & K.Hoffm. Macaranga fallacina Pax & K.Hoffm. 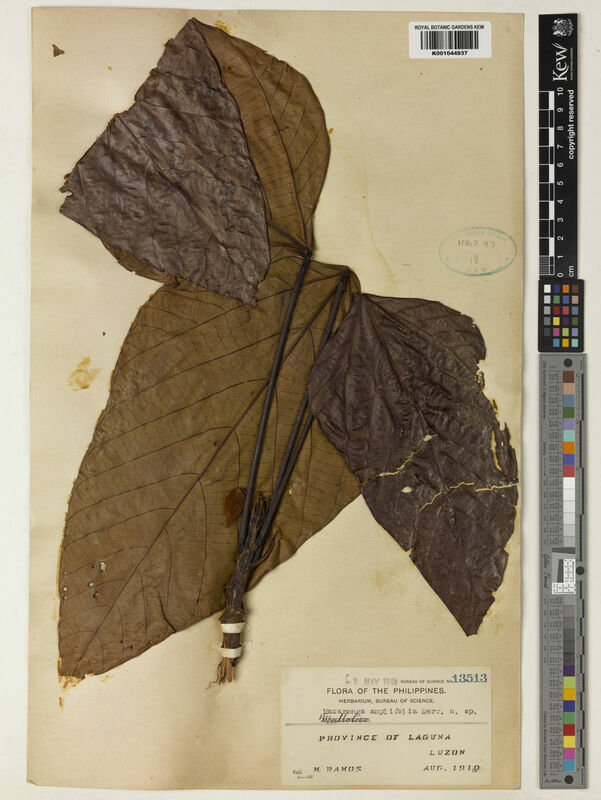 Macaranga glabra (Juss.) Pax & K.Hoffm. Macaranga gracilis Pax & K.Hoffm. Macaranga graeffeana Pax & K.Hoffm. Macaranga hemsleyana Pax & K.Hoffm. Macaranga inamoena F.Muell. ex Benth. Macaranga inermis Pax & K.Hoffm. Macaranga kurzii (Kuntze) Pax & K.Hoffm. Macaranga lanceolata Pax & K.Hoffm. Macaranga longistipulata (Kurz ex Teijsm. & Binn.) Müll.Arg. Macaranga mauritiana Bojer ex Baill. Macaranga modesta Pax & K.Hoffm. Macaranga nicobarica N.P.Balakr. & Chakr. 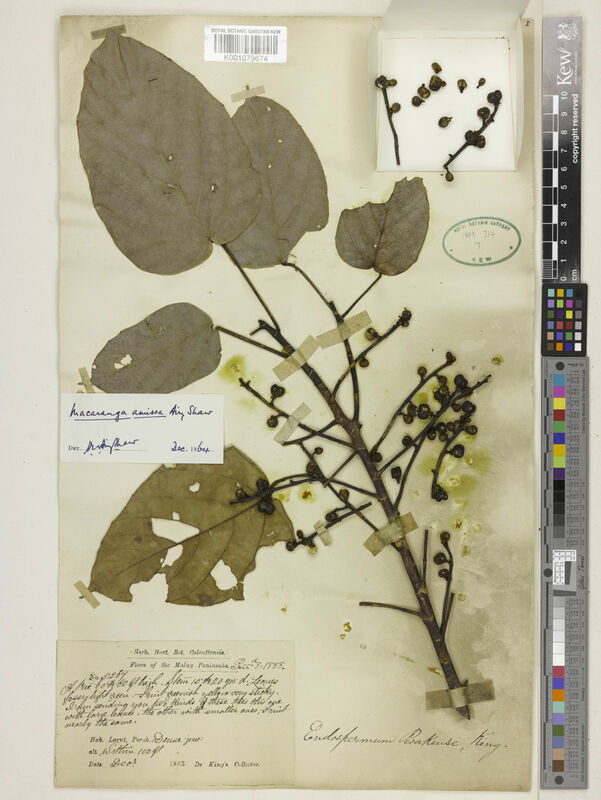 Macaranga papuana (J.J.Sm.) Pax & K.Hoffm. Macaranga parvibracteata Pax & K.Hoffm. Macaranga platyclada Pax & K.Hoffm. Macaranga pleiostemon Pax & K.Hoffm. Macaranga polyadenia Pax & K.Hoffm. Macaranga reiteriana Pax & K.Hoffm. Macaranga similis Pax & K.Hoffm. 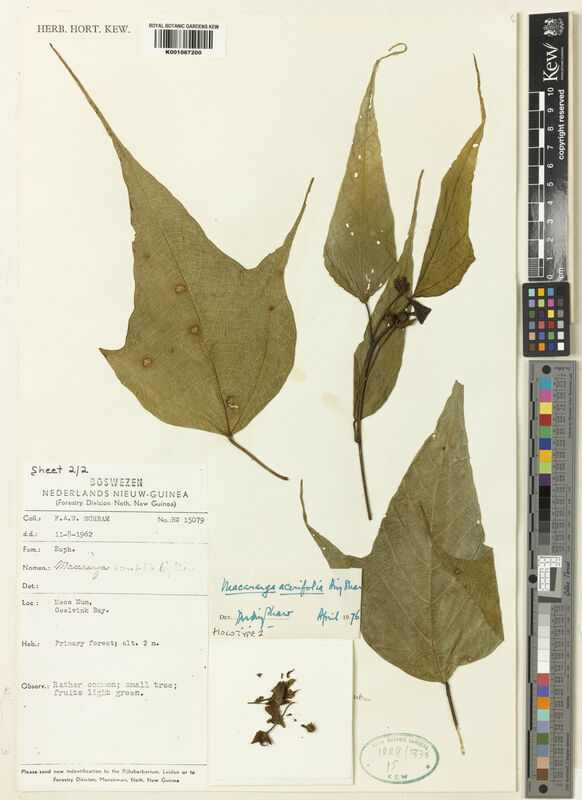 Macaranga stenophylla Pax & K.Hoffm. Macaranga strigosa Pax & K.Hoffm. Macaranga subpeltata K.Schum. & Lauterb. Macaranga velutina (Rchb.f. & Zoll.) Müll.Arg. Macaranga villosula Pax & K.Hoffm. Macaranga vitiensis Pax & K.Hoffm. Macaranga warburgiana Pax & K.Hoffm. Macaranga winkleri Pax & K.Hoffm. Adenoceras Rchb. & Zoll. ex Baill. Mecostylis Kurz ex Teijsm. & Binn. Pax & K. Hoffm. in Engl. Pflanzenr. Euph. 7: 298 (1914). Gen. Nov. Madag. : 26 (1806).